‘Real Food’ is Nigel Slater’s ground-breaking classic, a much-loved introduction to his inimitable easy style. Reissued alongside his forthcoming memoir, its focus is on the food that Nigel is passionate about, and these recipes are inspiring and accessible, ideal for the home cook. 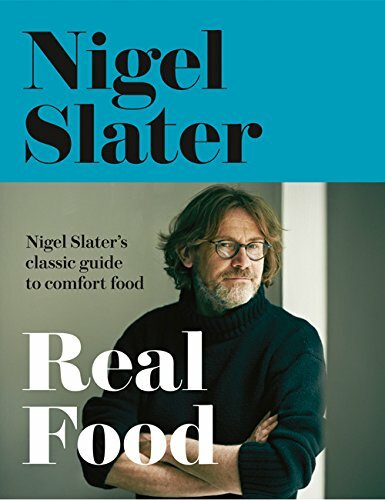 Since it’s publication in 1998, which tied in with his first TV series, stylish and innovative ‘Real Food’ has become the essential food book to have, both on the kitchen shelf and (qualified by his fanmail) on the bedside table. From sausages to ice cream, potatoes to garlic, the book covers Slater’s indispensable signature dishes – the ones you wouldn’t be without for love or money. Based on Nigel Slater’s absolute favourite food, whether it be The Stickiest Ever Chicken Wings or Baked Goat’s Cheese and Pesto in Filo Pastry, Smoked Mackerel Dauphinoise or the classic Bacon Butty, this classic has gone a long way in at last creating a nation of food lovers. In typically unpretentious style, Nigel finds good things to make using mass produced white bread to the finest Italian loaves, or with standard English confectionery to real chocolate made from cocoa solids. These recipes are still up-to-the-minute, accessible and inspiring. With Nigel’s unerring understanding of flavours, irresistible, simple recipes, and passionate lively writing, this attractive reissue edition proves that ‘REAL FOOD’ deserves its place on everyone’s kitchen shelf. NIGEL SLATER is a cook who writes. He has been the food columnist for The Observer for seventeen years and is presenter of BBC1’s Simple Suppers. Author of seven cookery books, including Appetite and The Kitchen Diaries, his latest book is the two-volume Tender (Autumn 2010). The film of his childhood memoir Toast is currently in post-production and due to be shown later in the year. Author, columnist and broadcaster, he remains very much an amateur cook. Nigel is not a chef. His food is understated, straightforward home cooking that is easy to accomplish and without a trace of what he affectionately calls ‘celebrity cheffery’. He is not fond of fussy food and prefers simple suppers made with care and thought. He believes that making something good to eat for your self or for others can lift the spirits in the way little else can. In November 2009 Nigel was presented with the award of Food Personality of the Year at the BBC Food and Farming Awards by His Royal Highness The Prince of Wales and was recently awarded an honorary degree (Master of Letters) from the University of Wolverhampton.